The following account is based on information obtained from my Great Uncle Albert Cooper. 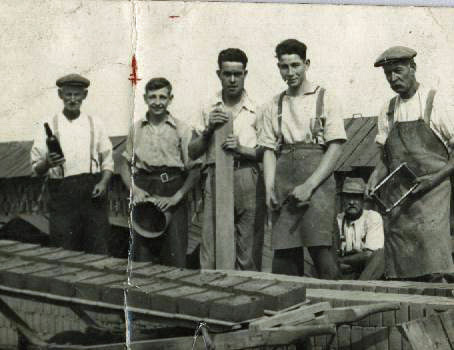 Albert started work in 1910 aged 13, which was the school leaving age at the time, in the engine sheds at Millhead Brickfield Great Wakering, which was situated half a mile due North of Great Wakering Church. At this time it was owned by Messrs D & C Rutter. 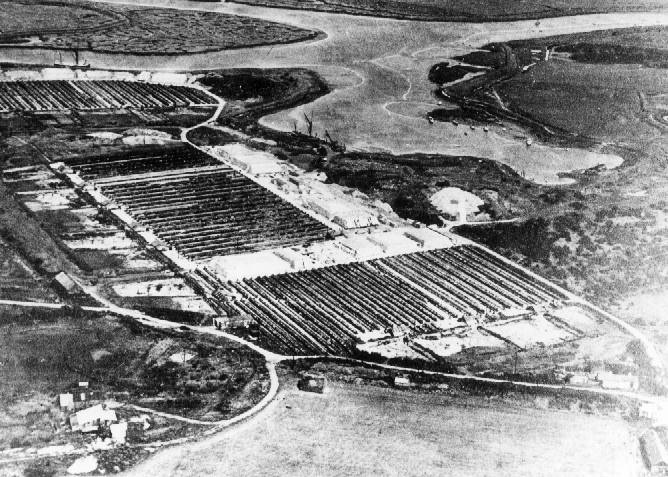 During the latter half of the nineteenth century it was discovered that the surrounding area of Great Wakering was very rich in clay deposits which was ideally suited for the manufacture of bricks. Local businessmen soon began to take advantage of this and the local industry of brick making began. Consideration was first given as to the site where this industry should be set up. In those days transportation was extremely limited with the choice of horse and cart or by water. In the event both methods were thought to be required and so the site was set up adjacent to the local creeks which could easily accommodate boats of reasonable draft at Landwick and Millhead. Thus employment was now available for local people both on land and sea. The basic principle of brick making was for the clay to be mixed with water to form a workable texture, moulded, placed in the sun to dry and then baked/fired to harden. The work was very hard and backbreaking. In the description that follows this will become more obvious. By 1900 Landwick Brickfield had closed but the diggings for brick clay for Millhead Brickfield had spread into the surrounding farm land. The top soil, approximately one foot thick, had to be removed to expose the six foot deep clay seam. All soil and clay was dug out by hand. By this time static steam driven engines had been set up at the brickfield. Their role was to pump water to where it was required and to drive the various hut ‘mills’ used to mix the brick dirt. A mill had to be constructed at each location where clay was dug which took the following form. A circular hole was dug in the ground four feet deep and twenty feet in diameter. Sectional steel was used to line the circumference of the mill and the bottom of the mill (normally known as pug-mill) was lined with bricks. On the bricks would be assembled a set of wooden arms fixed to a centre post to which would be attached three sets of long toothed harrows. Supporting rods for the centre post could then be placed in position. A long pole would be fixed to the top of the post to which a horse would be harnessed. The horse would then pull the harrows round the mill. In due time the horse was replaced by a portable steam engine. A ditch was dug from the mill back to the brickfield to a depth of approximately three feet and a water pipe was run from the pump shed to the mill. When all was ready the men would start to dig the clay which they loaded into barrows and tipped into the mill. This would be thoroughly mixed with water by the rotary action of the harrows and the resultant mixture was called ‘malm’. When thoroughly mixed the malm would be released into the ditch, where with the help of two 16 year old boys using a tool called a ‘lute’ (a 14 inch square blade of wood attached to a six foot pole), the malm would flow back to a large well adjacent to the engine shed. 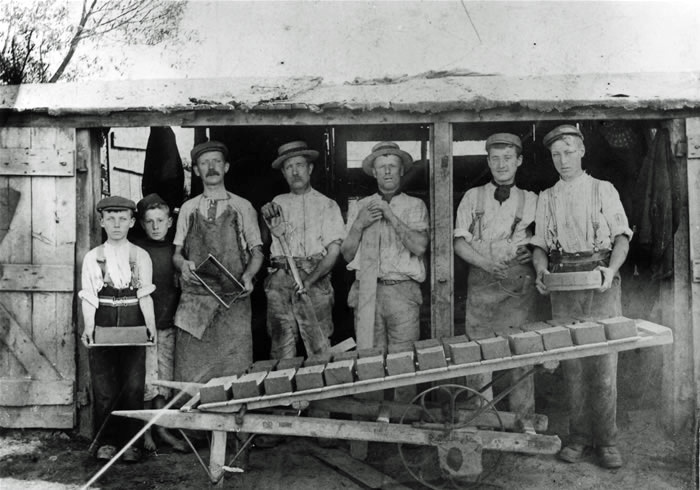 In 1910 there were 15 huts where approximately 16 million bricks per year were made. By the side of each hut was built, out of mud walls, a square area called the ‘backs’or ‘washbacks’. It was into these backs that the malm, still in liquid form, would be pumped. The depth of malm would be approximately five feet. Once full, the malm would remain and the water content would gradually dry out leaving just the brick earth. Prior to use this would be covered in a mixture called ‘soil’ to a depth of one foot. ‘Soil’ was originally the contents of London dust bins, which was transported from London by sailing vessels called Thames Barges. Offloaded and left to rot down for a period of up to three years the organic materials would have rotted away leaving vast quantities of cinders and other material that would burn. It was the job given to 14-16 year old boys to dig and sift with hand sifts before being mixed with brick earth for making the bricks. 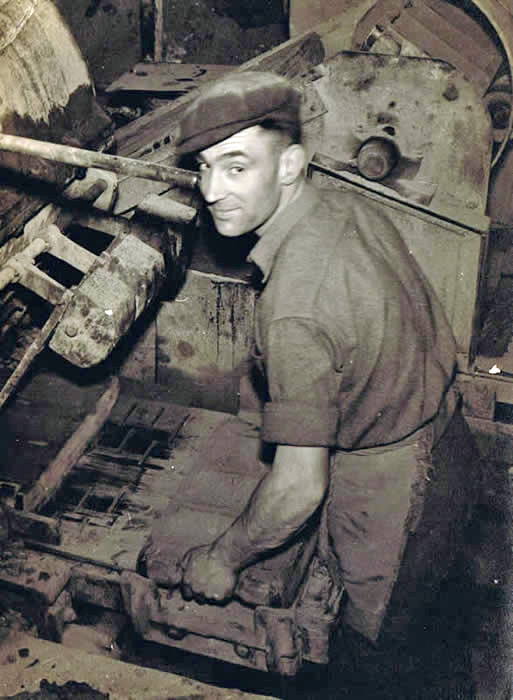 As can be imagined it was a very dirty and dusty task and most unpleasant. Many items were found during the sifting process including money, rings, table knives and forks. All these items were put to one side and bought by the local scrap dealer, the money from which helped to increase, by coppers, the boys’ meagre wages. When the brick making season commenced, the brick dirt called ‘pug’ was dug out of the backs by one person called a ‘temperer’. The tool he used was called a ‘cuckle’ which was rather like a three pronged fork but joined across the bottom. The temperer would load a barrow which would hold two and a half hundredweight of pug and tip it into a mill situated at the back of his brick making hut. He would add the water to the pug, the amount would depend on the texture of the pug, and this would be mixed together by the mill, being driven by a remote steam engine via a continuous chain. The temperer was normally middle aged. Pug was squeezed into the hut through a rectangle hole with the same dimensions as the brick mould. It was cut off by a person called a ‘flattie’ using a double handled cutting edge tool. The flatties were normally about seventeen years old. He would, with one motion, cover the pug with fine sand (which was normally brought by barge from Leigh on Sea) and mould as near as possible into the correct shape to fit the brick mould before placing it on the table next to the moulder. The ‘moulder’ (leader of the gang) would slap the ‘walk’, as the pug is now called, into the mould and force down with the palm of his hand and then level off with a ‘strike’. The strike was a narrow board of wood which was always used wet. Once the brick had been levelled off the moulder would turn and pick up another piece of wood called a pallet bearer, and with a twist of the wrist would turn the moulded brick out onto the pallet. He would then place this onto the ‘page’, a metal surface upon which the brick was slid to the ‘barrow loader’. An average of 900 bricks were made this way in one hour. Whilst making the bricks the flattie and moulder worked in a ‘standin’ which was the name given to a hole in the floor of the hut. As the name implies the barrow loader, whose average age was 14 years old, placed the wet brick carefully on the barrow. 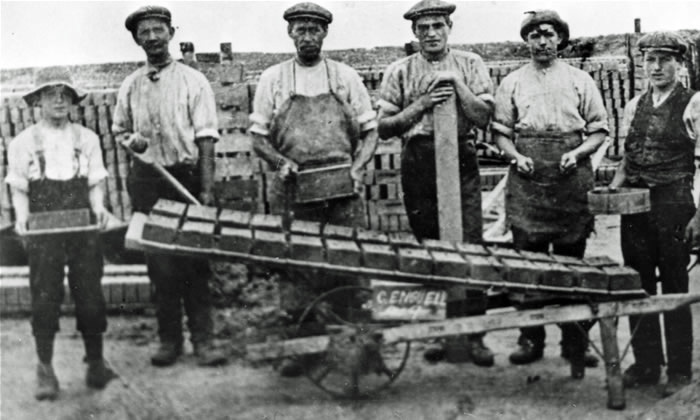 Twenty eight bricks were loaded on each barrow and each brick weighed nine pounds. When loaded the barrow was wheeled out by the ‘pusher out’ to the drying area known as the ‘hacks’. He would be met by the ‘off bearer’ who would be bringing back the empty barrow. The exchange would take place without stopping which meant taking the barrow whilst it was still moving. The barrows were wheeled on narrow metal plates six inches wide and twenty feet long. The off bearer stacked all the bricks, laying them out on edge in long rows. When one row was dried sufficiently to take the weight of the next this would then be stacked on top. The bricks would be left to dry out in the sun and this process was called ‘scintling’. The summers in those days seemed long and hot. Rain of course was the worst thing that could happen. Should it rain, the engine driving the pug mills would stop and all the work force would turn out to cover the bricks with wooden covers given the name of ‘hat caps’. In the summer when it was thought the night would be fine and dry the hat caps would be left off. If it then rained during the night the workers would be expected to return to the hacks and cover up without pay. When the brickfields were established, terraced housing was provided for some workers. These were built in Tinkers Lane (now known as New Road) and called Rutter’s Row. The brickfield foreman would come to the Row on rainy nights and shout the workers awake. When dry, the bricks would be put into kilns by people known as ‘crowders’. Fires would be built under the kiln and the bricks fired. After baking for many days they would be left until quite cold and then be sorted and graded before being transported to their destination by barge or horse and cart. The brickfield owned six horse and carts which were used for local delivery and each cart would hold 500 bricks. The names of some of the Wakering barges at the time were Juniper, Gascoigne, Anthony, KC, Wakering, Havengore and Rushley. Each barge could carry approximately 40,000 – 45,000 bricks. There were six people to each brick making gang housed in one hut. They were: - Temperer, Flattie, Moulder, Barrow Loader, Pusher out and Off-Bearer. If a member of the gang was unable to work one of the wives would help out, sometimes bringing a baby with her. Working hours were from 6am to 6pm. At 6am the mill would start and all had to be ready by that time. It was normal practice to be at the hut by 5.45am to be ready in time. There were three half hour breaks during the day, Breakfast 8.00 – 8.30am, Dinner 12.00 – 12.30pm and Tea 3.00 – 3.30pm, but during this time the standins had to be cleaned of sand and fresh sand brought up for the next session. An average of 900 bricks were made each hour. The moulder and off-bearer would change jobs every hour to enable the output rate to be achieved. An average of 44,000 bricks were produced by each hut per week. Wages were dependent on the number of bricks made. It was normal practice for the gangs to hold back payment on say 4,000 bricks in case the weather the following week was bad and they couldn’t achieve their quota. Normal wages per week at this time (in today’s currency) was £2.00 for the moulder, temperer and off-bearer, £1.50 for the flattie, 75p for the barrow pusher and 52.5p for the barrow loader. There were no facilities at all provided for the provision of food or for anywhere to eat it. Because of the very hard work food was necessary and it fell to the children of the workers to bring food to their fathers. Hot tea and food would be brought for breakfast and dinner. The children would run across the Common carrying the food in pudding basins wrapped in cloth, normally a red and white spotted handkerchief, to keep it warm. To enable the children to carry out this task they were allowed to leave school ten minutes early each dinner time. There were no toilet facilities provided except in the case when a woman was part of the gang and then a makeshift screen would be erected. A plank across a convenient ditch would have been considered a luxury. Water for washing hands before eating food was contained in an old bath outside the hut and was topped up by the water pumping engine. Pay day was on Saturdays but was not paid out until after work had finished. It was the moulder’s task, as head of the gang, to collect the money from the office for his group. The money was normally placed in his cap, loose, and sorted back at the hut. No bricks meant no money and the men would be laid off during the winter months. Fill in jobs were almost non existent so each person had to try and save a small amount to see them through this time. Local shop keepers would in most cases give extended credit until work started again. In 1912, Albert then aged 15 became ‘Drivers Mate’ on Traction Engines. At that time there were five steam traction engines kept in an engine shed of various types as follows:- two Wallace and Stephens, one Aran and Porter and one Garrett. As with the brick makers the working day started at 6.00am. This was the time when the engines had to leave the tractor shed. To enable this to happen the driver and his mate would have to be at the sheds very much earlier, in some cases at 5.00am. The fire embers would have to be tended and drawn up to get a head of steam. While the driver was attending to this, it was up to the mate to get the engine coal scuttle loaded with coal. Each engine would take up to four hundredweight to see it through the days work. The role of the engines at this time was to tow a trailer of bricks to wherever they were required in the Southend area. Each trailer would hold up to 2,500 bricks. The towing bar was of an ‘A’ frame construction. The drivers mate would need to lift the tow bar whilst the driver would back the tractor until the towing pin could be dropped through the towing eye. 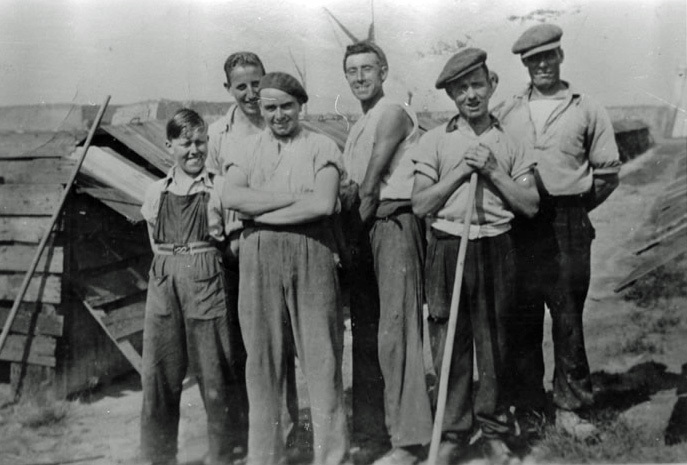 The trailers were loaded by the brickfield workers. There was only room on the tractor for the driver, he would need to steer and tend to the stoking of the firebox as required. The driver’s mate and the off-loader would ride on the trailer. When they reached their destination the trailer would be uncoupled and the off-loader would be left to unload and wheel the bricks to wherever they were required to be stacked. A wheelbarrow and six inch wide metal plates would be used. The journey to Southend would be broken by stops to top-up the water tanks. Bricks were frequently taken to Westcliff and Leigh on Sea. At this time Westborough Road was being built and of course the road was unmade. Two trips were made each day. When returning from the second trip, both trailers were towed back. It was frequently 7.00pm before the engine would reach Great Wakering and in the winter months a man holding a hurricane lamp would guide them across the unmade, deeply rutted Common Road. One of the traction engines had a carbide lamp which showed a certain amount of light. When back in the sheds a container holding paraffin and a waste material wick (the container was shaped like a teapot with a spout from which the waste rag projected) was all the lighting available for closing down the fire for the night. During 1912, it was thought that too much time was being wasted by driving backwards and forwards to Southend and so it was decided to load a barge and sail bricks round to the old Southend pier jetty opposite the Ship Hotel. Each barge would carry up to 45,000 bricks and the traction engines would be able to deliver up to another load per day. Unfortunately for the driver and mate if they happened to be on the jetty at 4.30-5.00pm and a barge was being unloaded they would have to load up the trailer and make another delivery sometimes up to Leigh, off-load all the bricks before returning to Great Wakering. In some cases they would not get home until 11.00pm and if they were due to be the first out in the morning they would be starting again at 4.30am. Albert’s mother who lived in St Johns Road would know when he was returning home by the noise the engine would make as it made its way up the village High Street. The water ‘stop-over’ point along Oldbury Road was still there in 1985. Saturday was engine cleaning day. Albert’s engine was the Aran and Porter and this was the one with the carbide lamp. All the engine tubes had to be thoroughly flushed out as did the tanks to prevent scaling. The whole engine then had to be cleaned making sure that all traces of mud and dirt had been removed. Brass had to be polished before normal finishing time at 12.00noon but it took far longer to complete the cleaning. Normally the foreman would inspect each traction engine at 3.00pm and if he wasn’t satisfied further cleaning would be done. There were three portable engines. One was used during the winter months for pumping water from the reservoirs and the other two for driving the malm mills. In the summer they would be moved and their job was then to drive the small mills of the brick making huts. During the winter the engines were housed in a very long dark shed. Interior lighting was by paraffin/waste material lamps which shed little light. The engines were coupled to the large pumps by belt drive. The pumps were for pumping water and there were also three large pumps which pumped the liquid malm from the storage well into the backs adjacent to the brick manufacturing huts. The pump diaphragms were made out of cow hides. It was the job of the person in the shed to cut the hide into the correct shape using a template, and with a metal punch, punch out the holes for the bolts to pass through when reassembling the pump. The pump casing was very heavy and a chain and tackle was used to remove the head. Albert worked in these sheds prior to being Drivers mate. Millhead Brickfield closed in about 1960. However, it is only recently that brick making ceased in the village and the last site in Star Lane which started in 1932 was demolished in 2007 and the land put up for sale.